My husband, Steve, and twelve-year old son, Zayne, are burrito fanatics. So, this recipe suits them well. 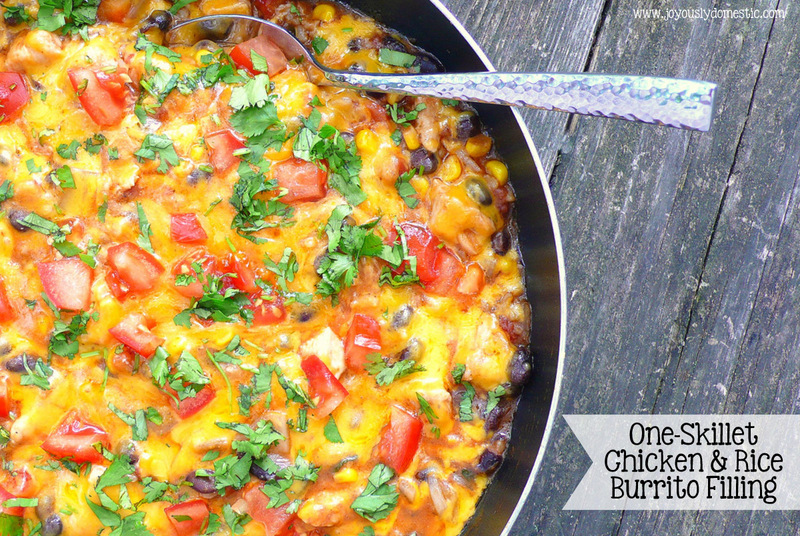 What I find both fascinating and glorious about this recipe is that all of the components that one would typically find in a loaded burrito come together in one pan. You don't have to cook the meat, rice and beans separately. It's all cooked in one skillet - along with a magnificent blending of spices, onions, corn, tomatoes and herbs. Score. This recipe comes together easily and is perfect for a busy weeknight. And, the leftovers are fabulous the next day. Once I spoon the filling onto the tortilla, I like to sprinkle on some chopped red onion, lots of extra cilantro and chopped avocado before rolling them up. Dipped in sour cream, these babies are scrumptious. NOTE: If you like things spicy, you can add in some chopped hot peppers to the filling mixture as it is cooking. Sauté the chopped onions in 2 tablespoons of olive oil over medium heat for about 1 minute in a large sauté pan or skillet. Move onions to the side of the pan and add in the chicken. Allow to slightly brown for about 2 - 3 minutes, stirring occasionally. Move chicken off to the side of the pan, as well. Add in the remaining 1 tablespoon of olive oil and add rice. Stir to coat rice in oil. Allow rice to cook for about 1 minute, then add in the garlic powder, oregano, chili powder, cumin, salt and red pepper flakes. Cook for 1 - 2 minutes so that spices slightly toast and "bloom." Add in the canned tomatoes, black beans, corn and chicken stock. Stir to combine. Bring mixture to a simmer, then reduce heat to medium-low. Allow to continue simmering for about 15 - 20 minutes. Cook until rice is tender, chicken is cooked and the majority of the liquid has evaporated. Add in the juice of 1 lime. Stir and adjust seasoning as needed. Sprinkle on the cheese, cover pan, remove from heat and allow to rest until cheese is fully melted. Top with fresh tomato and cilantro. Serve as a filling for burritos or quesadillas. Or, filling can be served over tortilla or corn chips in bowls. Garnish with additional toppings of your choice. Adapted from No. 2 Pencil. Oh YUM!! I'm thinking this also might be a hit over Mexican Rice!! That sounds like a yummy accompaniment to dinner! Hope you get a chance to try it, Kathy. It IS very good. :) Thanks for stopping by. Awesome! Love to hear feedback like this. Thank you, Amy.